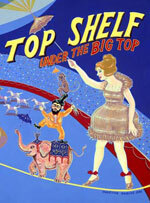 Published in 1999, right in the thick of the heat of millennial fever, Top Shelf: Under the Big Top was the eighth volume of the Top Shelf anthology series, which Top Shelf Productions co-honcho, Brent Warnock began publishing in 1995. In fact, some of the stories do touch upon what was then the approaching end of the millennium and beginning of next, and one can also read millennial subtexts into most of these stories. Under the Big Top is a wonderful way to see cartoonists working their craft, experimenting, storytelling, and even attempting both high and low art. Michael Bonfiglio’s “The Couple” certainly reads like an experiment in abstract art, leaving interpretation largely to the reader. K. Thor Jensen’s “Ghosts,” is an exercise in storytelling craft and looks like a “typical” indie comics short story, as does Jeff Levine’s “Have We Peaked Yet,” clever as it is. That anthologies like Top Shelf: Under the Big Top (Number 8) exists is a good thing, because an anthology can be like a big top. For underneath this giant canvas is space for a wonderfully diverse group of cartoonists to share their visions. It would be super duper good if those who claim to have such love for the medium of comics, but only read superhero/fantasy/sci-fi, would try something like Under the Big Top, which showcases so much of both the potential and art of the medium.